“We were bad fast all weekend, and we’ve been knocking at the door all year, so to close this season out with a win tonight, it’s something we’ve been working very hard on,” said a jubilant Seth Bergman who gave nothing but high praise and thanks to his family, sponsors, and crew. Despite the smiles and high-fives, Seth also explained that the win was nearly not, as an issue with the cooling system came close to dashing his hopes of finishing, much less winning. 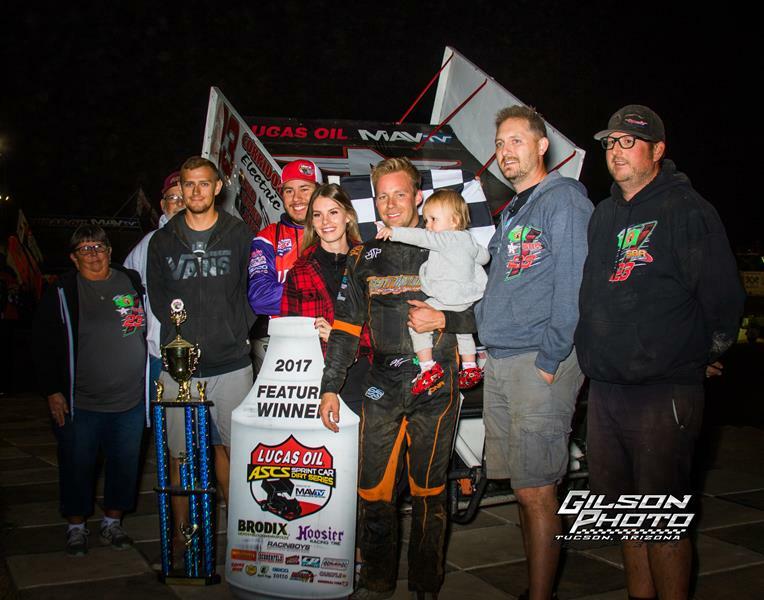 Seth’s 10th career Lucas Oil ASCS National Tour score since 2012, the final race of the 2017 season saw 30 non-stop laps and was enough to move Seth into the top-five in the series final standings. Earning the pole for the $5,000 to win affair, Seth used that front-row starting spot to rush into the lead over the Dissolvalloy No. 87. Keeping Aaron at a 10 car length deficit until the back of the field came into play, both drivers began carefully picking their way through. Bringing Reutzel within striking distance of the No. 23, several chances at a pass were voided as traffic played to the favor of Seth Bergman. Running through the backmarkers, the two lead cars pulled slide job after slide job through the field with Seth consistently keeping one to two cars between himself and the No. 87 until Lap 20. Surrendering the lead on Lap 21, Bergman began working to regain his lost momentum. With traffic working into the favor of the Corridor Electric No. 23 once more, Seth began closing the gap with five laps to go. Working back to the No. 87 with a full head of steam, Seth regained the lead in traffic on Lap 28 and would not relinquish the top spot. Crossing 2.669 seconds ahead of Aaron Reutzel, the No. 87 was also lucky to finish as the engine had started to turn sour in the last few laps. Along with traffic, it all played into the hands of Seth Bergman. Finishing third was Joey Saldana with Sam Hafertepe, Jr. and Wayne Johnson making up the top-five. A true showing of the pace set by Seth Bergman, as only three drivers failed to finish, Travis Rilat crossed sixth with Jason Solwold and Harli White rounding out the drivers left on the lead lap. First car a lap down in ninth was driven by Lucas Wolfe with Johnny Herrera finishing tenth. For Hafertepe, the fourth-place run put him finishing the season with a 376 point buffer over second place, and his second career Lucas Oil ASCS National Tour Championship worth $60,000, which was presented to him by series founder, Emmett Hahn, on the front straightaway. Hafertepe ends the season with a record tying 15 Lucas Oil ASCS National Tour wins. Skylar Gee was also honored with a $2,000 bonus and a set of Brodix Cylinder Heads as the 2017 Rookie of the Year. With Qualifiers set up by event points, four were contested with Harli White, Matt Covington, Lucas Wolfe, and Justin Sanders picking up wins. The B-Main was topped by Billy Chester. The CP-Carrillo Hard Charger of the Night was Skylar Gee. The 2018 season is in the works with plans to release the lineup for the series 27th season during the Performance Racing Industries Tradeshow in Indianapolis in December.